EUROPEAN RUGBY sometimes feels like a school dance. Some nervous sorts can feel flashes of panic and exhilaration as they stand, seemingly alone on the big stage, while celebrated individuals dance round and in front of them. Indeed, much like any formal event at any high school, the first rounds of the Heineken Cup can be brutal or beautiful, depending on your perspective. At the half-way stage of the Pool stages each team gets to rerun the fun as the fixtures from round three are reversed and played out one more time. For some this will be a joy and the confident ones are happy to cut loose. For others – the wallflowers and awkward shufflers –this represents another opportunity to be forced to the fringes and possibly humiliated. Thomond Park may have been ringing with derision as Saracens were unfairly booed, but the home side would not have minded as they collected a valuable win. Much like poor old Gangnam Style’s Psy, Munster have done the same old dance over and over again for the amusement of a baying crowd. 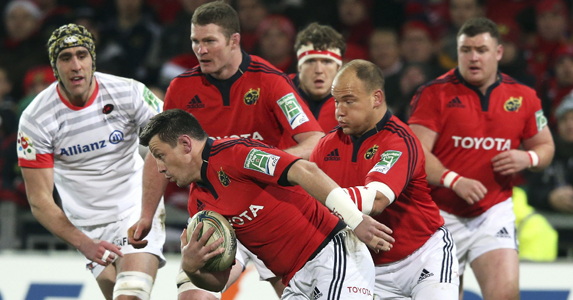 Playing the normally stuffy Sarries they had to produce and old-style Munster performance. Indeed, head coach Rob Penney may have tried to force wholesale stylistic change on Munster, but when O’Gara and co. get into their familiar groove, they win European games. However, having let Saracens off with a losing bonus point, they will have to do it again outside of Limerick in Round Four. On the mountainside in France, few want to tangle with Clermont. The Top 14 side have now reached the impressive milestone of winning at home 51 consecutive times, this time at the expense of reigning European champions Leinster, and they did so without taxing themselves too much. Heading to Dublin with a five point pool advantage, they will be trying not to get too spooked by the persistent question of whether or not this is their year. They have always come up short and coach Vern Cotter will know that his hardest task is getting his charges to believe. Never have so many menacing men needed so much persistent reassurance. Quite simply, the Ulstermen are scary. Scary because of what they have done and scary because of what they can still do. They are both brutal and beautiful when in the mood. Can they stand up this season and win the ‘big one’ in May at the Aviva Stadium? Dan Parks has been written off more times than the Del Boy’s Robin Reliant, but old Parksy still has a game or two in him. Faced with the seemingly impossible task of defeating Biarritz, the Connacht player-coach responded in the same fashion he has always responded. By sitting snugly in the pocket and kicking at the sticks. Three penalties, two drop goals and a conversion by the former Scotland fly-half were enough to see him and his west Irish pals celebrating an unlikely victory over a side with genuine Heineken Cup pedigree. It’s fair to say the scrum half-has an uphill battle trying to drag the Ospreys through Europe, but he is giving it a bloody good go. Against Toulouse, his kicking up the tramlines was effective and he was sharp and strong enough to bludgeon his way to the try-line. He was attempting to show his team mates what enthusiasm is worth and people are noticing because he is already captain of the side. His stock is soaring in South Wales. If he leads the team out at home this weekend, he may even be able to coax some Welsh youngsters into the games of their lives. 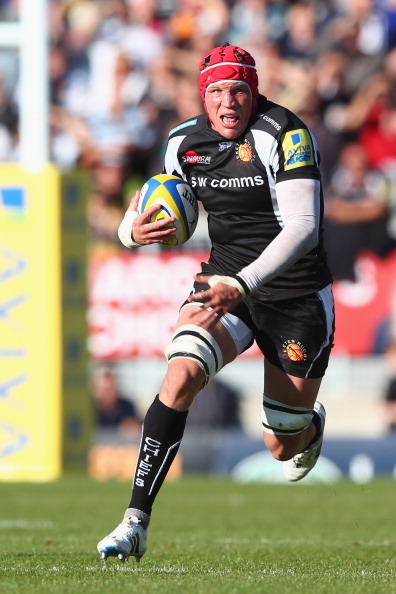 The Exeter Chief is now a trusted member of the England squad, impressing with his no-frills approach. The confidence to do so comes from playing well and seeing his side mount a credible challenge in the European competition. Against Llanelli Scarlets at the weekend, the blindside made 10 carries and 10 tackles and was part of a cohesive forward unit. He is proving to be the type of player you want in the trenches with you and still vastly underrated. With a European weekend looming, the man with the buttons must have been worried about the fourth-ranked team in France jetting in to Glasgow. However, he need not have feared. He could sit back and relax as Glasgow Warriors and Castres plodded to a 6-9 snooze fest. He only had to flex his clicking-finger five times. Not one for the highlights packages.